EDMONTON, Alberta, Canada, January 10, 2011 (ENS) – A University of Alberta paleontology researcher has identified a new species of pterosaur, a flying reptile that lived more than 70 million years ago. The fossil is not only a newly discovered species, it’s the first pterosaur of any kind to be found in British Columbia. It was found on Hornby Island, off the east coast of Vancouver Island. Victoria Arbour says she was stumped when the small piece of jawbone was first pulled out of a fossil storage cabinet in the university’s Paleontology Department last spring. She said her first clue to the fossil’s identity came after she compared it to known species of pterosaur that roamed China more than 70 million years ago. “I found a previously published paper describing the teeth of a previously discovered pterosaur and ours was very close,” said Arbour. That led Arbour to believe her new species, named Gwawinapterus beardi was a scavenger of the late Cretaceous period. “It had a wing span of about three meters and patrolled the sky and set down to feed on the leftover kills made by predator dinosaurs of the time such as Albertosaurus,” she explained. 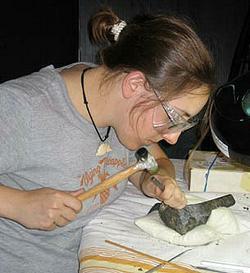 The jawbone was found by a woman on Hornby Island three years ago. She gave it to Graham Beard, an amateur paleontologist who runs the Vancouver Island Paleontological Museum at Qualicum Beach. Beard could not identify the fossil and so passed it along to the University of Alberta, where it was stored until Arbour began her investigation. The newly named species, Gwawinapterus beardi, honors Beard. The Gwawinapterus portion of the name derives from a combination of “Gwa’wina,” which means raven in the Kwak’wala language of the Kwakwaka’wakw people indigenous to Hornby Island, and the Greek word “pteron,” meaning wing. 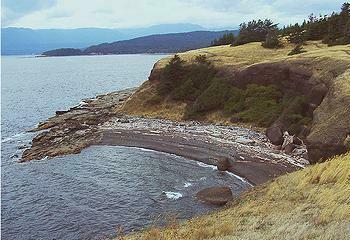 Hornby Island occupies a unique location right in the middle of the Georgia Strait, but Arbour says the place where the fossil was found has little to do with the area where the living pterosaur flew some 70 million years ago.